Having worked in the field of career services for quite some time, I’ve seen my fair share of resumes. I’ve also become an expert in maximizing space on resumes. 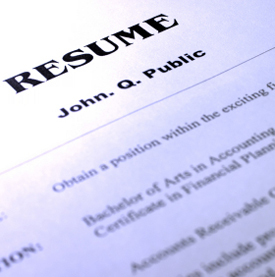 Generally, if you are a recent grad (<5 years) you want to keep your resume to a page. After that you may need to go to 2 pages. (Keep in mind, if you have a 2 page resume, fill the entire 2nd page. 1.5 pages is not an option!) Unless you are writing an academic CV, 2 pages is generally what I recommend as the maximum number of pages for a resume. I’ve had a ton of people say they can’t fit their resume to 1 page or they can’t fit it to 2 pages so I’ve developed a series of tricks in order to maximize space on the page. Let me know what you think! 1. Increase your margins to .5 all the way around. White space may be popular in graphic design, but in the resume world it’s all about maximizing the space on the page. 2. Instead of 12pt font try 11pt. Keep in mind that your reader will actually have to be able to SEE what’s on the page so try not to go below 11! Remember, your name should always be slightly larger. 3. Make the content breaks smaller. Just because you are using 11pt font doesn’t mean your breaks in content need to be 11pt. Try 5 in order to maximize space. 4. Maximize each line. Do you have some bullets where only 1 or 2 words are falling on the next line? Try to tighten up the bullet to take up only full lines in order to maximize space. 5. Put your Organization, Title, City/State, and Dates of employment all on one line. This allows you to maximize the space you have for your actual content and bullet points. 6. Put your address, email, and phone number all on one line just below your name. No need to use 2-3 lines for this content when you can get it on 1. When all else fails there is always the “&” which saves you 2 characters per “and”! What do you think? Any tricks I don’t have up my sleeve that I should know about?